The idea of building a sustainable house first came up a couple of years ago, in conversation with my architect friend Duncan Annand in Cambridge. I don't remember who first mentioned strawbales, but the idea quickly grew into a planning application, which we first tried to submit in the summer of 2009. The site was in the garden of the house on the outskirts of Newmachar, just north of Aberdeen, that I had converted from a granite ruin twenty something years ago, to Duncan's design. That house was let while I was living and working in Norway, and I was in the process of giving most of it to my sons. The new house was to be an annex to the 'guest flat' that already exists in the adajacent steading. 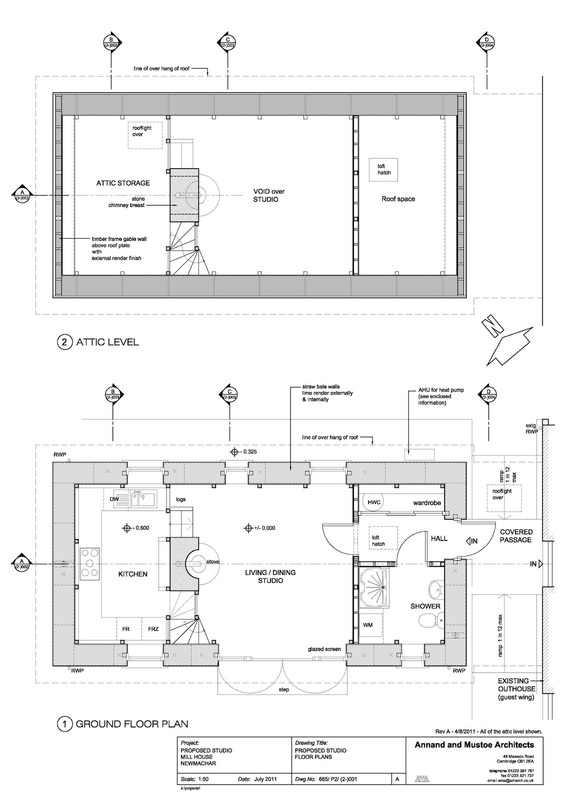 Just a single storey; living room, kitchen, shower-room, and a sort of attic over the kitchen. The first problem was bats - or rather the need to prove that there were no bats in residence who might be disturbed by the building. As they were already settling down for the winter by the time the application was considered, we had to wait till the following spring to have a bat survey. The bat man and his wife came one evening in May, before sunset, to observe where the bats emerged from for their evening feed. There were plenty of bats around, but fortunately none came out from our roofspace. 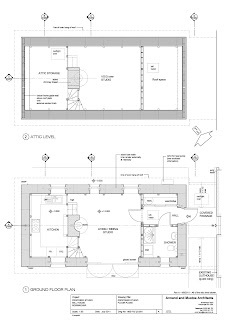 Planning permission was granted late in 2010, and the next stage was the building warrant. As well as the consultant engineer Allan Baldry used by Duncan to advise on the superstructure, we needed a local engineer to check the subsoil, and write the specifications for the foundations. Engineers tend to have a belt-and-braces approach, and having two involved meant, I'm sure, a double margin of safety. No chance of our house of straw being blown away. Meanwhile, we read the books, watched Grand Designs, and enrolled for a weekend course on strawbale building at the Dorset Centre for Rural Skills near Blandford, in mid-December. My youngest son Nicholas, and Maria's son Marian were to attend the course with me. But it was the coldest cold spell in Dorset for many years - down to -14 degrees - and the course was cancelled as the Centre was cut off. However, Rob Buckley, who runs the course, helped enormously with practical advice during the detailed design stage. We finally got to attend a course at the DCRS in May, with my brother-in-law Richard attending in Marian's place. There was one other learner, and between the four of us we put together a simple strawbale structure, learning essential information such as how to retie bales when mice have eaten through the twine, and how to sharpen the ends of hazel stakes used to hold the bales together. It was an invaluable experience. In early July, Nick and I were in Newmachar, preparing for the building work to start. I picked up the 10-year-old Citroën van that I'd bought from the local car dealer (a stroke of luck - he normally only has cars). Realised later that it fulfilled an ambition of mine - I always wanted a 2CV van! Time to order all the supplies we would need - mainly timber. Rob Buckley had recommended using green douglas fir, and I searched for a supplier. Allan Baldry suggested a company near Kirriemuir that worked in oak and Douglas fir, and I arranged a visit. Nick and I drove down on July 8, and spent an hour or so with Pete Cummins; the company makes traditional timber frame houses in oak, so it was immediately clear that they couldn't help us, but seeing the kind of work they do - frames held together with enormous mortise and tenon joints - was inspiring. He gave us a few addresses of timber producers who might have 'duggie fir' as he called it. It was a long way to go for information, but a pleasant inaugural trip in the van, which both of us enjoyed driving. After a few phone calls and emails, we found a supplier near Dumbarton - run as a charity, specialising in local timber - and decided on Scottish larch, which is, apparently, as good as douglas fir for use in the unseasoned state. I made up the order based on the drawings - some to be planed (dressed), the rest (what would not show in the final building) sawn. There were the main posts (94mm square), 225x50 purlins, 225x75 eaves beams, 100x100 posts for inside the strawbale walls, lots of 100x50, and sarking boards. The timber - several tons of it - was delivered on August 10, in heavy rain. It had to be deposited in next-door's drive, so we had to move it into our garden quickly. I was due to fly to Oslo that afternoon, so could only spend 2 or 3 hours with Nick getting soaked moving the wood across the wall into our garden where it was restacked. We managed less than half. He heroically moved the rest - including the heaviest pieces - over the next few days (at least the sun was shining). But the two central purlins had too long a span to use regular wood - we needed Glulam. I searched the internet for the nearest suppliers, but couldn't find any in Scotland. It seems that Glulam is only made on the continent, and it is imported for big jobs according to needs. I found a supplier in Yorkshire, who happened to have a left-over piece that was twice as wide as we needed and a bit thicker; he agreed to slice it down the middle and plane it to size, but transport was the problem - it would have cost several hundred pounds to get the beams as far as Dumbarton to join the main load of timber. I looked at various options - including hitching a lift on a lorry transporting steel to Ralph Ross (about whom more later) - but in the end hit on the crazy idea of buying a boat trailer (which I'll need one day, albeit in Norway) and collecting the beams ourselves. So Nick introduced me to eBay; we found a suitable-looking one in Lancashire, and I left Nick to bid for it; in the last few seconds, he clinched the deal for 171 pounds. On Wednesday August 17, we drove down the main road to Edinburgh (Nick's favourite road, he said), to York to say hello to Simon, Angela and Della, and then to Leeds to stay in Nick's flat. Next day, to Blackburn, to pick up the trailer. It was in good condition, shorter than I expected, but it looked as if it might cope with having wooden beams strapped to it. With the trailer bouncing behind us, we headed back south, to the outskirts of Barnsley. Paul Tracey at Constructional Timber met us with the two beams carefully bound together and wrapped in clingfilm. He and his factory floor colleagues were surprised (to say the least) by the flimsiness of the trailer (as I was surprised by the size of the beams!) but between us we worked out a way of securely fixing them one on each side of the long axis of the trailer. So they were separated and rewrapped and Paul and another man spent a good half-hour making a really solid job of it. We had taken a gamble, buying the trailer unseen, and not having a proper idea how to carry the beams (I had taken 4 ratchet straps and some old red underpants to hang on the end - not much else), but it had paid off, thanks to their help - it could so easily have been a disaster. We shared the driving back north, had a break for a surprisingly good meal at a sort of glorified transport cafe somewhere on the A1 north of Newcastle, fortunately didn't have to reverse the trailer, were not stopped by the police for having a dangerous load (Nick's fear), and arrived at Mill House around midnight (Nick driving the last few hours - he doesn't seem to get sleepy as I do). Meanwhile, the foundations were well underway. Cairnmor is a family building company - Bob Morrison had built the extension on Mill House 20 years ago, and his son Allan now runs the company. They had heard about my plans, and Allan was particuarly interested in the strawbale concept (and his father was sure he could procure the strawbales for me when the time comes). We agreed that they would do the work on a 'time and materials' basis. They started late-July, knowing that their work had to be finished in time for the timber frame to be built a month later (and the concrete should be 2 weeks old before drilling into it). The floor level has to be close to the floor level in the already converted part of the steading, of which the new building is officially an extension, and that meant that ground level would be about a foot below the level of the lawn. So the topsoil had to be removed over a bigger area than the house's footprint, and then trenches dug for the foundations and a bigger hole for the kitchen which is at a lower level. The excavation revealed (as Roy next door and friend Martin observed) that we are on a small hillock rather than a moraine heap (the cut was through original shaley bedrock). Masses of concrete were poured into the holes - the Morrisons observed with good humour (after all, they were being paid for it) that the foundations were strong enough for a 3-storey house rather than the lightweight building we had in mind. The strawbale walls will start about 50 cm above the (lowered) ground level, on a wooden ring-beam placed on top of a concrete block base-wall faced with granite. Nick and I searched the garden for suitable stones - not too thick, with a flattish face, squarish, with small stones to fill gaps - and Allan, Bob and Mike (their young assistant) did an excellent job (so neat that someone asked if the stone facing was real). Meanwhile, I had contacted Ralph Ross, who did various bits of steelwork for the main house, carport and conservatory years ago. He has a major steel fabrication business, working for the oil industry, but still enjoys little jobs. He has moved from Dyce to Parkhill, where he has a new, green-ish factory and offices - the rainwater from the turf roof is collected in a an ornamental pond, and used as a grey water supply, as well as being recirculated over the roof when it is dry. He was keen to hear about our eco-house. I asked him to make the shoes to hold the posts, and brackets for fixing the purlins to the chimney, as well as cutting lengths of threaded rod for fixing the shoes to the concrete. With Maria were her son, Marian, her brother, Peter, and their neighbours Dusan and Marta. They had kindly agreed to spend a long week helping to build the timber frame - though in the end, rather than helping, they did virtually all of it, and the rest of us just joined in with the simpler bits. Dusan is a skilled woodworker and knows how to get pieces of wood to fit neatly together (by profession he is a cooper) and it was a treat to watch him, remembering the problems I had with the 3D joints in the conservatory roof. Peter is also skilled, but was definitely Dusan's deputy. Maria and Marta spent most of the time cooking (no good my pointing out that carbohydrates rather than meat are what you need for energy). We were joined for dinner most evenings by our friendly tenants (I mean tenants who have become friends) Tanja and Gero and their 2-year-old son Liam, who was fascinated by all the building activities. The first job was to position the posts (my job, interpreting the drawings) and fix the shoes to the concrete for the posts to be bolted to. The fixing was by resin anchors - lengths of threaded rod set in resin in holes in the concrete - set hard in a few hours. Ralph had lent us a powerful Hilti drill. The posts were temporarily braced to stop them waving about. The eaves beam was then fixed along the top of the posts, with bolts. Each side was in 3 parts, joined by scarfe joints (specified to be close to a post and in such an orientation that the short stub from a post carried the weight of the longer length from the next post) bolted together. This was where Dusan's expertise was first revealed. And the wood was heavy, so holding it in place while fixing was tricky. After that, the purlins - 3 sections, the middle one being the glulam beams. They are fixed to posts, and to the chimney with a clever steel bracket made by Ralph Ross. The rafters are notched to fit over the eaves beams and purlins and they meet at the top against the ridge beam (relatively lightweight, compared with the other beams, as they take no load to speak of). Cutting the notches in the first rafters was an iterative process, but after that Dusan and Peter had the confidence to cut them in advance. Apart from Nick and Marian, we had help from Sam Green, a young graduate biologist waiting for a job, and from Sergey, my Russian postdoc from Norway, over in Britain for a few days and keen to see what I was up to. We fixed the ties in position across the rafters just above the purlins. We also started work on the ring beam - a box structure, with top and bottom panels of 'smartply', sitting on the stone wall as the base for the strawbales. Thanks to generally dry weather (if cool), and the determination of Dusan and Peter, the frame was finished right on schedule - with time for a half-day excursion to Glen Garioch distillery and then Dunottar castle (closed) and Stonehaven before they headed home. After their departure, Nick and I took a 2-day break, driving to Lochinver to visit old friends Lesley and Gordon. The west coast is so different! Bought Nick boots in Inverness, but weather too wet to do any hiking. Back on site, we continued with the ring beam, with Sam's help. Made in sections, with staggered joins, it took some ingenuity and a lot of time. Finally, second son Simon came up for a long weekend, and we concentrated on getting the sarking on. I knew he would enjoy working up high. We still had scaffolding inside the frame, and used ladders outside, working up from the eaves. We spent most of the time on top, with Nick receiving our orders to cut boards to specific lengths. This wood is much coarser and irregular in width, thickness and straightness than the wood for the rest of the structure (but is still green larch). The house really looked house-like by the end. 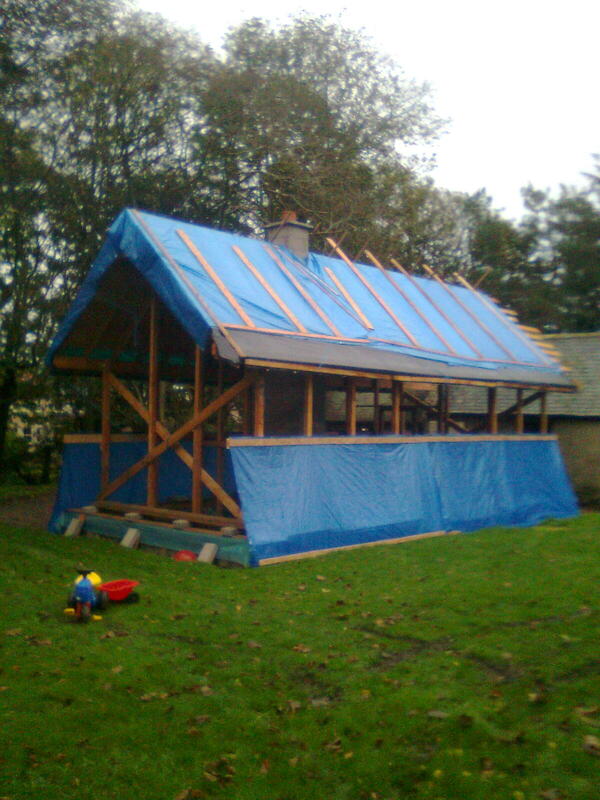 We covered the roof with tarpaulins, battened down, and covered the ring beam with layers of polythene. Just after I had taken Simon to the station, the heavens opened and we had a good test of the tarpaulins. Water runs straight off the roof onto the walls, of course, so I will find a way to divert the water over the walls, to reduce the risk of the ringbeams getting wet. A very successful start - everything I hoped for achieved. Now we have to hope for some dry straw to be kept for us over the winter. PS In October, with Gero and Liam's help, we put up this tarpaulin 'tent' to direct rainwater away from the wooden ringbeam. PPS The framework survived the severe December gales unscathed. The frame of the house survived the winter gales with no sign of damage, and only traces of water in the lower kitchen area that I had expected to turn into a swimming pool. Serious work on the strawbale house resumed in the spring, when I spent several days making the 'upper ring beam' - a wooden box section structure (longitudinal battens sandwiched between OSB boards the width of the bales) to go all around the house on top of the bales. I used as a template the lower ring beam that we made last year, and built it in sections to be joined together once in place. I returned in mid-June, to prepare for the major effort of raising the bale-walls and lowering the roof onto the bales. First I extended the rafters with the sprockets that create the overhang along the sides of the building, and will carry the gutters. A straightforward job, but important to have the sprockets at the same level and the ends lined up for the eventual fascia board fixed to their ends. Duncan was in Scotland and came up to Newmachar for a flying visit, to see the building for the first time and to advise on how to proceed with the ring beam - whether to raise it before putting the bales in place or to place it on top of them. We agreed that the only way was to get the beam into place first. Meanwhile I was making arrangements - trying to find someone with a baler to convert the big round bales that Donald Ingram has been saving for us into 'small' rectangular ones, ordering Velux windows, getting in touch with a mason who knows how to do lime harling (Andy Newcombe, of Masonry and Lime, in Forres). One of the problems was to find a source of hazel (or any other) stakes to pin the bales together. I couldn't find anyone in Scotland, and ended up driving down to Cumbria where I filled the van with 160 stakes (and then went to visit Simon and family in York on the way back to Scotland). Raising the ring beam sections single-handed needed scaffold towers, ropes, and ingenuity. Posts for the windows and doorways had to be set in holes in the lower beam and fed through corresponding holes in the upper beam; at the right height, short battens nailed to the posts held the beam in place. The side pieces were straightforward as they could be suspended from the eaves beam by ropes until they were fixed at the right height. The ends were difficult, as there were no beams to suspend them from. I rigged up brackets to support them, fixed to the posts that are fixed to the roof. When all sections were in place and joined together there were a couple of small gaps - indicating that the posts to the roof are not quite vertical and the house is fractionally wider at the top. We finally found a farmer with a baler near Oldmeldrum and arranged for him to bring it to Donald's shed. We spent an evening breaking up the big bales and feeding the straw into the baler. Balers are notoriously temperamental (just listen to the Archers) and on this one the mechanism that ties the bales jammed at least a dozen times. The flywheel is connected to the drive by a bolt that is designed to shear when it jams, and eventually we ran out of replacement bolts and had to give up - having made about 120 bales. In the end I bought some ready-made bales from the Oldmeldrum farmer to make up the number we needed. All this was happening the week before everyone was due to come to assemble the walls, and it was touch-and-go whether they would have anything to assemble. The core strawbale team comprised Nicholas, myself, Maria, her son Marian and nephew Andrej. Nick and I had been on the course in Dorset and had the confidence to get started, but the others soon got the hang of it. The first course was impaled on sharpened hazel stubs set in the ringbeam (which we filled with sheep's wool for insulation), and hammered home with an enormous mallet (called a persuader). The bales have a cut side and a rough side, and they are laid alternately. The second course is laid, like bricks, with joints staggered, so that everything is bonded. The dimensions of the house are never a whole number of bales, and at doors and windows half-bales are needed. The knack in making bales shorter is to retie them before splitting them. We used long steel needles to push the twine through, and pulled it as tight as possible befor tying with a clever 'trucker's knot'. With both parts retied, the old strings are cut and the two halves fall apart - that is, unless the strings have passed over each other while being threaded through, and there is a knack to avoiding that. Friends Lesley and Gordon from the far NW of Scotland came for the day just to help us with the walls, and enjoyed learning the new skills. After the third course, we started driving hazel stakes down through the bales - and also inserting horizontal stakes at corners - to pin everything together. This was hard work, and we skimped a bit - having read in Barbara's book that they don't always use them at all. But we did try to pin through the upper ringbeam and the top courses - before filling the ringbeam with sheeps wool plus mothballs, and putting the OSB 'lid' on the ringbeam. Building the walls went quickly - it took us about 4 days to put in the 5 courses. But we suffered from what Barbara Jones calls 'bale frenzy' - with the result that the corners bulged out. A classic mistake, to be rectified, if possible, at a later stage. Too late we put up boards at the corners, fixed to upper and lower ringbeams, but they couldn't stop the bulging once it had started. Brother-in-law Richard and nephew Sam arrived from Dorset just in time for the last of the bale laying (Richard attended the course last year with Nick and me) and stayed for the weekend. The upper ringbeam was postioned to allow five courses of bales to be put in place with a few cm to spare. The idea then was to attach the rafters to the ringbeam with plywood plates, and then lower the roof plus ringbeam onto the bales, to compress them and make a firm wall. (At the gable ends we had to attach the purlins to the ringbeam with vertical studs.) The roof had been bolted to about 20 vertical posts since last year, so all these bolts had to be taken out to allow the roof to drop. This I regarded as an engineering problem and fortunately we had Len, Simon's father-in-law, on hand for a weekend. In fact the whole family came up - Anne and Len, Angela and Simon, and year-old Della (who took to carrying a measuring tape with her - promising!) We built a structure of two vertical posts and a beam the width of the house with which, starting at the east end, we could jack up the roof (using trolley jacks) to release pressure on the bolts, remove the bolts, then move along to the next pair of posts. This worked, but the whole process took longer than expected. We also loosened the bolts securing the bracket that fixes the purlins to the chimney; the bracket was made with a slit so that it, and the whole roof, can slide down over the bolt to a certain extent. The house was then left for a few weeks to settle down. I was next in Scotland in late August. The south side of the roof had fallen by 12 cm, the other side by only 8 - no idea why. I refixed the lower side onto the posts, but left the other side to fall some more. Nick was up for most of September, and I was there again for a week in the middle of the month. We installed the Velux window over the kitchen area (tricky cutting through the rafters and rebuilding the roof around the hole, but finally putting it in place was easy). (A distraction - a woodpellet burner was installed, in the old stable, to replace the oil-fired boiler for the main house and provide heat to the bothy and the new house, eventually. This meant having a trench dug across the lawn to take the insulated pipes of hot water to the house. It also meant building a pellet store of 8 cubic metres, but that is another story.) Once the Velux was in place, Alistair could start slating the roof. We had the slates delivered in the long-suffering neighbours' drive, so Nick and I spent a morning moving half of them (a couple of tons, we reckoned) into our garden, and then, as it was a spectacularly beautiful late summer day, we went and climbed Bennachie. Swallows (or martins, I couldn't tell the difference) were circling the summit, just for the pleasure of it, I'm sure. It's only a hill, but it feels like a mountain. Back to base, where we moved the rest of the slates and felt very satisfied with the day. Mid-October - Maria and Simon joined me for a long weekend - Simon to help me to build the pellet store, Maria to trim the bales ready for harling. Sam Green from Aberdeen joined us, too - he is now qualified as an electrician, and installed coduits in the bales for future cables. Alistair had slated the north side of the roof, which had sunk a couple more centimetres, so I reattached the purlins to the posts on that side, too. Which meant that, now everything was fixed, the harling could start. Maria did a great job reducing the bulges on the corners. I prepared the gable end walls above the ringbeam; studs and OSB, breathable membrane, then vertical battens for attaching laths to take the harling, continuously with the strawbales below. The laths had to be riven oak - shipped up from Somerset, with a strong, sweet smell. I had no time to fix the laths and left it for Andy Newcombe. At the end of October, I came for another long weekend, to finish building the pellet store, and to see how things were progressing. Alistair had finished the roof, and Andy's Masonry and Lime were working on the harling, hoping to finish the first two coats before any bad frosts. Alistair's fine roof was covered on the south side with solar panels, and we started generating electricity. Time to relax and let the house take its chances through the winter?